I’ve already looked at the state of play within the county of West Midlands, where Labour has a solid wedge of seats that won’t alter very much come polling day. 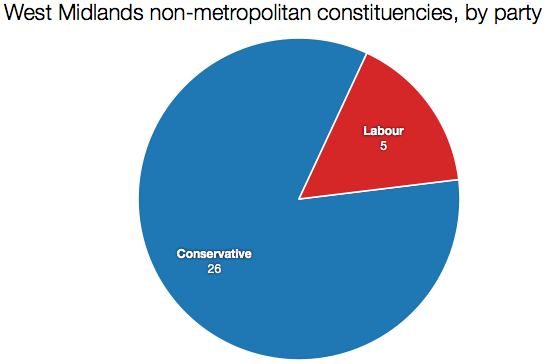 The Tories have a commanding majority of seats across the shires. 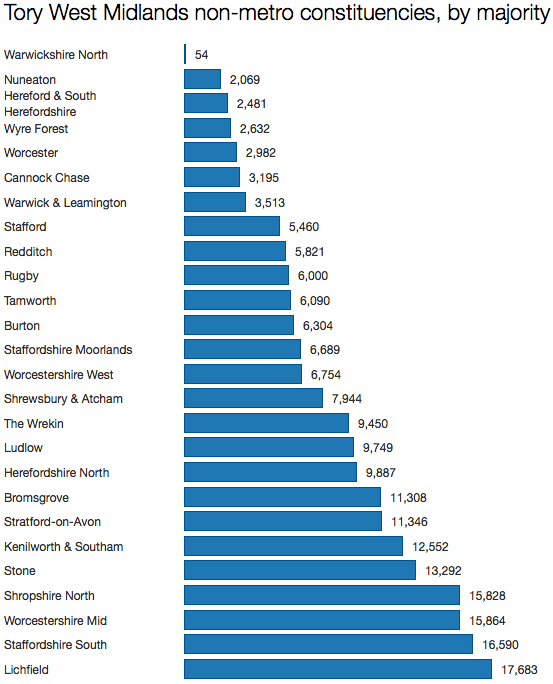 In three of the counties – Herefordshire, Warwickshire and Worcestershire – they hold every single seat. The region is polarised sharply between the three urban centres of Telford, Newcastle-under-Lyme and Stoke-on-Trent (all held by Labour) and everywhere else (held by the Tories). David Wright’s ultra-marginal seat of Telford ought to be a major worry for Labour, with challenges likely from both the Tories and Ukip. The other four seats should be safe. The party has five targets in the region, including the most marginal Tory seat in the country. But given the increasingly inconsistent picture painted by the opinion polls, plus the impact Ukip may or may not have on what would otherwise be straight two-party fights, it is hard to say with confidence that Labour will do as well in the West Midlands as it once believed it could. Dan Byles is not even attempting a defence of his majority of 54 in Warwickshire North. This seat should fall to Labour easily, and the party ought to take back Nuneaton as well. Cannock Chase might be a possible gain, given that Aidan Burley is standing down after a somewhat undignified few years. But beyond that I doubt anything else will change hands. There are some huge Tory majorities in this part of England, and most are large enough to withstand even a moderate slice of Ukip insurgency. Unless the likes of Bill Cash in Stone suddenly decides to defect to Nigel Farage’s party, there won’t be much else to see here.